Knowing that I was going to one of the nation’s oyster capitals, I also knew that I would eat well. But when I got to Apalach, I was surprised to learn just how small the area was. It was all made clear when we had to go to the Piggly Wiggly. If you really want to conduct a sociological experiment while on the road, take some time out to visit the grocery stores. I once met Alain de Botton at a reading of his book,The Art of Travel, and he intimated as much. Piggly Wiggly, an institution in the rural South, has what you’d expect: pork rinds, okra, cheese straws, barbecue, Blue Bell ice cream, grape NeHi soda. We had been dispatched to pick up a few things at Apalach’s Pig, and I didn’t think we’d succeed. We had olive oil on the list, for chrissakes! I’m a food snob for sure and think that every grocery should carry extra virgin olive oil, but I really thought we were pushing our luck. Ah, but the Food Network’s power is great! We found several types of olive oil – right next to some artisan balsamic vinegars. Garlic was not as easy to track down. It was sold in two-packs, rather than loose, and it didn’t look so good. I don’t remember ever seeing a real bulb of garlic until I was well into my teens. My mother didn’t cook with it when I was growing up. Now I can’t imagine how someone cooks without it. One thing that I’m always on the lookout for when I’m down South are Danish Wedding Cookies. Why they’re not sold north of Georgia, I’ll never know. I’d like to start a campaign to bring them north. Anyhow, I spotted the hot pink box of cookies at the Piggly Wiggly and put them in my cart. Joy! Another good find of the day: a bucket of fried chicken for a buck. Yep. One dollar. Not sure how long the chicken had set out that day, but it was pretty damn good. How could I pass up such a deal?? But let’s get back to the seafood. On the way down to Apalach from Tallahassee, we stopped at Posey’s, a rough neck oyster bar on the St. Mark’s River. It stunk of fish so much that my 5-year-old niece kept her fingers in her nostrils the entire time. We sat at a picnic table near the water – so close that I was sure an alligator was going to lunge out from the edge and devour one of the little mutts hanging around outside. We ordered oysters on the halfshell for the table. I think I’ve always been used to eating fresh oysters at fancy places, so I was surprised to lift the shells to my mouth and see little barnacles still hanging off the surface. The surrounding tables looked at me and Anthony as we slurped up our oysters. Everyone else was using their plastic forks to remove the oyster, place it on a saltine, and douse it with hot sauce. Weaklings! I figured I was in the land of oysters, so I had a fried oyster sandwich as my entree. It was just okay. The fresh oysters, sweet tea, and the $2.50 beers would be the only reason I’d go back. I could tell this was a place you avoided once the sun went down. It was about 1pm, and already the inside bar was saturated in smoke. In the women’s restroom, someone had left a community hair brush. Nice touch in theory but not in practice. At least one meal per day, from Saturday to Tuesday, involved fish or shellfish. We had a shrimp boil on the first night. The Zatarain’s spice packets that we used for the pot peppered the air to the point that we were all coughing and sneezing until the food was done. On day two, we went in search of clams. We wanted to make spaghetti and clam sauce. We’ve been in the habit of making Italian dishes on Sundays – better for watching the Sopranos. When we approached the first seafood shack by the bay, two leathery men stood up as if they’d never seen a female before. The older one said to me, “You look like you’re ready to spread your wings and go on a jouney.” There are hippies in Apalachicola?? It was late in the day, so the hippies didn’t have what we wanted. We went next door to the Island View shack. They had myriad open flats of fresh fish, oysters, and shrimp. We went for the Grouper fillet, which cooked up quite nicely with a little garlic (from the Piggly Wiggly trip), parsley, olive oil, and lemon. Another day, another seafood search. Crabs have been about $39 a dozen in Maryland for the past few years. In Apalachicola, they were about $8 a dozen. I don’t really go for boiling things alive, but I went along with Anthony’s quest. With a shaker of Old Bay, a couple cans of beer (for the boil), and a dozen blue crabs, we were set. On day three, we had an existential crisis. Anthony had been talking so much about how he wanted to fishing. The solitude of a man and his line sounded attractive, I suppose. So he rented one from the Survivors store. 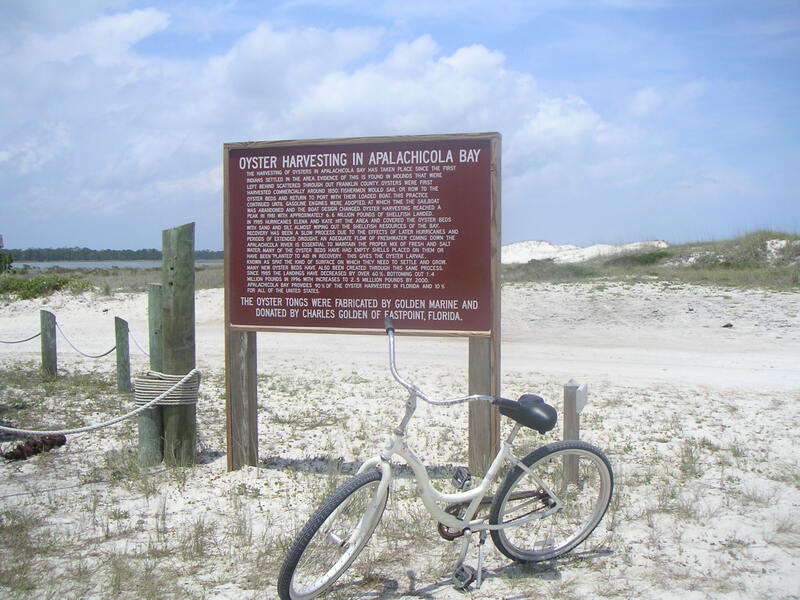 The beach on St. George Island is unregulated enough that you can fish right from the shore. While I sunbathed and read another boring magazine, Anthony cast his line and watched the waves roll in and out. I really don’t think he thought he’d catch a fish. He caught a couple of small fish that he had to throw back. But right as I was laughing at his bad luck, a speckled trout tugged on his line. He reeled it in, unhooked it, and took it down to show another lonely fishertourist. The trout measured 15 inches. You can only keep fish that are between 15 and 20 inches, so we could keep this one. But then we’d have to watch it die. It’s so hypocritical to eat fish but be opposed to fishing. I was a little confused with my feelings. On the one hand, I wanted the poor fish to live. On the other, I was pretty proud that Anthony finally caught a fish that I found myself screaming bloody murder when he threatened to throw the fish back in the ocean. During the indecision, the fish was getting less and less oxygen as it swam around the plastic white bucket. It was too late for the fish. So we decided to keep him. Of course, one 15-incher can’t feed six people. So we had to catch another one. Anthony caught a whiting – again 15 inches – and we were set for (part of) dinner. We cooked the speckled trout with tomato, onion, and lemon and the whiting with garlic, parsley, and lemon. It was certainly a little harder to eat, knowing where the fish came from. But we enjoyed it anyhow.